News From the Vatican | St. Joseph Cupertino Fraternity - Theme for the Year "Living Our Charism Within Our Culture"
Vatican City, 5 January 2016 (VIS) – In the late morning Pope Francis traveled by car to the shrine of Greccio, arriving shortly before 3 p.m. He went to Greccio to emphasize, “touch”, as the representation of the Nativity wanted by the saint whose name it bears was a way to make more concretely close to the most needy and destitute – which are at the center of the pontificate of Pope Francis – “We too, not just the richest, could – could – build, build a crib”. The Pope had expressed the desire to learn more about Greccio and the place from which the crib has spread worldwide thanks to St. Francis. So in response to a secret invitation, just before Christmas, by the bishop, the Holy Father made a surprised visit to the shrine. Pope Francis said he wanted to come to enter the place of the first performance of the nativity scene that took place in 1223. Before going to the shrine, the Pope met with a group of 150 young people who were having a meeting of the diocese: surprise came from the back of the room when he entered. We met for about 10 minutes, speaking extemporaneously between wide-eyed youth that never would have imagined having him so close. Francis spoke to the young people of the star that expresses the choices to be made. He also pointed out that we all need a star to follow. Then he referred to the Baby Jesus that is the sign of God’s humility but also a clear indication of travel to those who are smaller, helpless and marginalized. Finally, he took some selfies. Everything happened in a dimension very familiar, it was very beautiful and intense, said the bishop in Greccio. The Franciscan friars were amazed by the arrival of “the Pontiff” – revealed to Tv2000 Father Alfredo Silvestri, guardian of the sanctuary of Greccio – we were not prepared. At that moment I did not have my habit on and went quickly to fine one. Father Alfredo Silvestri went to the shrine to open the gate for the Pope. The Pope was intrigued by this place, so remote, and lived very intensely the moment of the physical with this ancient space, enjoying himself for a few moments in silence in front of the medieval fresco depicting St. Francis with the next fresco of the Virgin Mary breastfeeding the baby Jesus. The Pope remained silent for a long time staring at this fresco. The most beautiful scene is when Francis kissed the altar where every morning we celebrate the Eucharist. It was a moving gesture, said Father Alfredo Silvestri. “Thanks be to God, two spouses, parents of Saint Therese of Lisieux, were canonized, Saints are not only priests and nuns, but also lay people,” pointed out Cardinal Amato, referring to this exemplary French married couple. As Secular Franciscans they attended daily Mass at 5:30 am, Angelus and Vespers, rest on Sundays, fasting during Lent. They invited poor people to dine in their home and they visited the elderly. They also taught their daughters to treat the underprivileged as equals. Zelie died of a very painful cancer at 46. Louis was left with five very young daughters: Marie, Pauline, Leonie, Celine and Therese, who was only four and a half years old but who always remembered her Mother as a Saint. Louis died in 1894, after suffering a serious mental illness. Pope Benedict XVI beatified both parents on October 19, 2008. Their canonization was the first joint canonization of a married couple. Many have proposed their life of daily holiness as a model for our time. St. John Paul II proclaimed Saint Therese of Lisieux a Doctor of the Church in 1997. “We always remember the image of St. Francis, who was not afraid to embrace the leper and to welcome those who suffer any kind of marginalization. In fact, dear brothers, the gospel of the marginalized, is played and it turns out and proves our credibility. Here is the testing ground of an authentic Christian life and shows with determination on the path of his Church welcoming and out: the gospel of the marginalized, lived by the Holy man of Assisi , and the choice of the logic of love against the temptations of fear, and the closure of self-restraint. Vatican City, 11 January 2014 (VIS) – The feast of the Baptism of the Lord concludes the season of the Nativity and the Pope, during the Angelus at midday today, commenting on the passage in the Gospel of St. Mark – when the heavens open at the moment at which John the Baptist baptizes Jesus in the Jordan – affirmed that this event marks the end of “the time of the closed heavens, which indicated the separation of God and man as a consequence of sin”. Sin “alienates us from God and ruptures the bond between earth and heaven, causing misery and failure in our lives. The open heavens indicate that God has given His grace so that the earth may bear His fruit. Thus the world transforms into God’s dwelling amid humanity, and each one of us has the opportunity to meet the Son of God, experiencing all of His love and infinite mercy. We find Him truly present in the Sacraments, especially the Eucharist. We are able to recognize Him in the face of our brothers, especially the poor, the sick, the imprisoned, and refugees; they are the living flesh of the suffering Christ and the visible image of the invisible God”. With the Baptism of Jesus, not only did the heavens open, but also “God speaks, making his voice resound anew: ‘You are my beloved Son: with you I am well pleased’. … And then the Holy Spirit descends, in the form of a dove: this enables Christ, the consecrated of the Lord, to inaugurate His mission, which is our salvation”. The Holy Father remarked that the Holy Spirit is forgotten in our prayers: “We need to ask for His help, His strength, His inspiration. The Holy Spirit, that fully inspired the life and ministry of Jesus, is the same Spirit that today guides Christian existence, the existence of a man and a woman who say they wish to be Christians. Placing under the action of the Holy Spirit our life as Christians and the mission that we have all received by virtue of our Baptism means rediscovering the apostolic courage necessary to overcome easy worldly comforts. … A Christian or a community that is deaf to the voice of the Holy Spirit, Who urges us to take the Gospel to the outermost limits of the world and of society, also becomes a mute Christian or community, unable to speak or to evangelize”. “Remember to pray often that the Holy Spirit might help us and give us strength and inspiration, leading us forward”, concluded Pope Francis who, following the Angelus prayer, asked the faithful gathered in St. Peter’s Square, especially those from Sri Lanka and the Philippines, to pray for him during his apostolic trip to these two countries, to commence tomorrow. Vatican City – “This is a gift for you from the Pope on the occasion of his birthday,” volunteers and Swiss Guards were quoted as saying to hundreds of homeless people, as they handed out batches of sleeping bags to them yesterday. The sleeping bags were distributed on a minibus, which left the Vatican at 6 pm and went around Rome looking for homeless people who needed them. The quality bags had a hood and carried the papal ensign. The special “mission” took place on Francis’ birthday and concluded after 11 pm. God is like a mother, loves us free, but we often want to control this grace in a kind of spiritual accounting. God loves us for free – as a mother her child. And the child “is loved”: “this is the grace of God.” “But we, many times, to be sure, we want to control this grace” and “in the history and also in our lives we are tempted to commodify the grace,” make it “as a commodity or something controllable”, maybe saying to ourselves “But, I have so much grace,” or, “I have a clean soul, are in grace”: “And so this truth so beautiful of God’s closeness slips accounts spiritual: ‘No, I do this because this will give me 300 days of grace … I do that other because this will give me this, and so accumulating grace’. But what is grace? A commodity? And so, it seems so. It seems so. And in the history of this closeness of God to his people has been betrayed our attitude, selfish, wanting to control this grace, mercificarla “. “And St. Paul reacts strongly against the spirituality of the law.’I am right if I do this, this, this. If I do not do this I am not right ‘. But you are right because God has drawn near, because God caress, because God tells you these beautiful things with tenderness: this is our justice, this closeness of God, this tenderness, this love. At the risk of seeming ridiculous our God is so good. If we had the courage to open our hearts to this tenderness of God, how much spiritual freedom we would have! How much! Today, if you have a little ‘time, at home, take the Bible: Isaiah, chapter 41, verse 13 to 20, seven verses. And read it. This tenderness of God, this God who sings in each of us a lullaby, like a mother. Francis wants to be free to introduce people, does not want to be caged or overly protected. And, when you stop being “out of program” self discovery to greet the faithful in St. Peter’s Square is reset when formalism and rigidity protocol to facilitate the immediacy of communication, the Pope seeks the Argentine direct contact. Observes a “Vatican Insider” historian Alberto Melloni Christianity: “Francis has made the conscious choice to remove the ritual of the court of the Prince and all of this is a result of his choice: the house, the car, the canteen.” In short, “behaves as he sees fit,” adds Professor Melloni: “Francis has removed the ritual by prince using his powers of the sovereign, therefore, does what he wants and no one can tell you that something can not be done or should be done in different forms. ” In addition, points Melloni: “Benedict XVI celebrated with a pallium from the Pope, not a bishop,” while “Francesco, as they were until John Paul II, has restored to him the pallium which is similar to that of the metropolitan archbishops.” A decision that has “a significant liturgical meaning,” says Melloni. The pleasures of art, literature and playing together with children have been lost, he said. “Consumerism has brought us anxiety” and stress, causing people to lose a “healthy culture of leisure.” Their time is “swallowed up” so people can’t share it with anyone. Even though many parents work long hours, they must set aside time to play with their children; work schedules make it “complicated, but you must do it,” he said. Families must also turn off the TV when they sit down to eat because, even though television is useful for keeping up with the news, having it on during mealtime “doesn’t let you communicate” with each other, the pope said. “We need to be creative with young people. If they have no opportunities they will get into drugs” and be more vulnerable to suicide, he said. “It’s not enough to give them food,” he said. “Dignity is given to you when you can bring food home” from one’s own labor. Vatican City, 27 July 2014 (VIS) – As on every Sunday, Pope Francis appeared at the window of his study to pray the Angelus with the faithful gathered in St. Peter’s Square. The Pontiff, as in the Mass celebrated the day before in Caserta, spoke about the two parables about the kingdom of Heaven: the jewel merchant who finds a pearl of infinite value and sells everything he owns to buy it, and the farmer who chances upon hidden treasure and sells all his land to buy the field where it lies. Neither the merchant nor the farmer have any doubt about their actions as they are aware of the incomparable value of what they have found. “It is the same with the kingdom of God”, explained the bishop of Rome. “He who finds it has no doubt, he knows that he has found what he sought and awaited, and which answers his most authentic aspirations. It is truly like this: those who know Jesus, who encounter Him personally, are fascinated, attracted by such goodness, such truth, such beauty, and all this in great humility and simplicity. Seeking and finding Jesus: this is the greatest treasure of all!”. “How many people, how many saints, reading the Gospel with an open heart, have been so struck by Jesus that they have converted to Him. Let us think of St. Francis of Assisi; he was already a Christian, but lukewarm, a “rose-water” Christian. When he read the Gospel, in a decisive moment during his youth, he encountered Jesus and discovered the Kingdom of God, and from then on all his dreams of earthly glory vanished. The Gospel lets you know the true Jesus, it lets you know the living Jesus; it speaks to your heart and changes your life. And from then on, he left everything. You can effectively change the type of life you lead, or continue to do what you did before, but you are different, you are born again: you have found that which gives meaning, flavour and light to everything, even to hardship, suffering and death”. The Pope went on to repeat the importance of reading a passage from the Gospel every day; of keeping it in our pockets, our bags, always at hand, as “everything makes sense when you find this treasure that Jesus called ‘the Kingdom of God’: that is, God Who reigns in your life, in our lives. God is love, peace and joy in every man and in all men. … Reading the Gospel means finding Jesus and receiving this Christian joy, which is a gift from the Holy Spirit”. “The joy of encountering the treasure of the Kingdom of God becomes clear, it can be seen”, concluded the Pontiff. “The Christian cannot conceal his faith, as it shines through in every word and every gesture, even the simplest everyday ones. The love that God has given us through Jesus shines through. Let us pray, by the intercession of the Virgin Mary, that His Kingdom of love, justice and peace may come to us and to all the world”. When priests told him to take a break and go on holiday, Milan’s Cardinal Alfredo Ildefonso Schuster smiled and answered that there would be all the time in the world to do that once he was in heaven. Francis – the Jesuit Pope whose hectic schedule would put even a 40 year old man to shame – seems to be following in his footsteps despite his age (he is 77) which sometimes leads him to have to call off a meeting or two. This was the case with his visit to the “Agostino Gemelli” hospital in Rome, Friday. “Speaking to Italian newspaper La Stampa and Vatican Insider, the Vatican spokesman, Fr. Federico Lombardi explained that the Pope “decides his own agenda and leads a very intense life because he feels he is called to serve the Lord with all his strength. He never took time off even when he was Archbishop of Buenos Aires.” Francis doesn’t even stop on a Tuesday, the traditional day of papal rest when his predecessors usually had no audiences or other important commitments. Instead of making the most of this morning to rest, he uses it to catch up on meetings that have been put on hold. “Francis follows the lifestyle of St. Ignatius, who in the order’s constitutions defined the Jesuits as “labourers in the Lord’s vineyard” so he dedicates himself entirely to his mission, even going beyond the limits of his own strength,” Fr. Lombardi said. Over the past hundred years, papal agendas have become more and more packed; they have more commitments, more public events to attend and more speeches to give. A quick look at the statistics confirms this. The Pope’s daily morning mass in St. Martha’s House, which is attended by about 60 people, is something completely new. Although his predecessors also said daily mass in the private chapel of the papal apartment, they did not give a sermon and the masses were not broadcast by Vatican Radio or filmed. Practically no one would have been able to tell whether they were unwell, feverish or late to a meeting or event. From March 2013 to the present day, Francis has celebrated 229 masses with as many homilies given off the cuff and every time he has stopped to personally greet each of the faithful present: that means he has greeted at least twelve thousand people at these morning masses alone. The Pope has led 95 big liturgical celebrations in Rome or on his visits outside Rome. On these occasions he gave a total of 73 homilies. Since March 2013, Francis has written one encyclical (Lumen Fidei) and an Apostolic Exhortation (“Evangelii Gaudium”), three apostolic letters, four motu proprios and 45 official letters. He has pronounced or sent 55 messages (including a number of video messages). Since he was elected Pope, Francis has given 231 speeches, plus the 73 addresses he has given before the Angelus. Although it is widely known that Francis has collaborators who help him prepare the texts for his speeches, they still follow his instructions and this obviously takes up some of his time. Another new element of this pontificate are the Wednesday audiences. Francis has held 54 of them so far. According to estimates given by the Prefecture of the Papal Household, over six million people attend the Angelus and the General Audiences. The current Pope spends a lot more time with the faithful in St. Peter’s Square that his predecessors. He goes up and down the square in the Popemobile, to greet everyone and get close to those who are further away. Given the size of these events, they have been held in the square, even in winter. All of Francis’ outdoor General Audiences put together have lasted as many as 150 hours in total. And they have gone ahead regardless of the weather conditions. Sometimes the Pope has even attended when he has been unwell. It is impossible to calculate exactly how many people the Pope has received individually in audience and the number of sick the Pope has met with. The amount of private correspondence the Pope receives has also increased notably. He personally reads about fifty of the four thousand letters he receives each week and gives instructions for the responses. In some cases he replies personally to phone calls. Then there are his travels. Two abroad (to Brazil and the Holy Land) and four within Italy. Not to mention his five visits to Roman parishes. Here two Francis has introduced a new style: his visits to Roman parishes take place on a Sunday afternoon and he spends several hours with faithful. When he is in the Vatican, the Pope wakes up at 4:45 am and dresses himself. The first thing he does is to read the “ciphers” he receives from Nunciatures all around the world; he then prays for over an hour and meditates the Scriptures of the day, preparing his homily for the mass in St. Martha’s House. At 7 he goes, unaccompanied as always, to celebrate mass, after which he greets each of those present and has breakfast. Then his working morning begins, with audiences and meetings. At 1 pm he has lunch, followed by a half an hour nap. In the afternoon he prays and resumes his meeting schedule, deals with his correspondence and makes telephone calls. At the end of the day, before dinner at 8 pm, he usually spends an hour of worship in the chapel. “Sometimes you can’t do everything,” Francis admitted to a group of seminarists. “I sometimes let myself get carried away with certain things and this is not wise: too much work, or thinking that if I don’t do something today I won’t do it tomorrow… then I don’t have time for worship, I don’t have time for a nap…” The ideal thing is to end the day feeling tired. You don’t need to take pills: end your day tired. But let this be a good tiredness, not imprudent tiredness, because this is bad for your health and the price you pay is high in the long run. This would be ideal, but I don’t always do it because I am a sinner too and I am not always that organised,” he admitted. Francis describes himself not as a superman but as a “sinner”, who feels exhausted at the end of the day and is forced now and again to cancel some of his commitments. 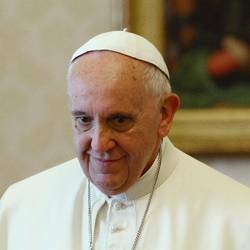 Vatican City, 30 June 2014 (VIS) – On Saturday afternoon, in the Lourdes Grotto in the Vatican Gardens, the Pope met with a group of young people from the diocese of Rome embarking on a vocational journey. “This visit to the Virgin is very important in our lives”, he said. “She accompanies us also in our definitive choice, the vocational choice, as she accompanied her Son on his vocational path which was so hard and so painful”. Vatican City, 16 March 2014 (VIS) – At midday today the Holy Father appeared at the window of his study to pray the Angelus with the faithful gathered in St. Peter’s Square. On this, the second Sunday of Lent, Pope Francis reflected upon the Transfiguration of Christ and urged the faithful this week to “listen to Jesus” and to read a passage from the Gospel every day. “We, as Jesus’ disciples, are called upon to be people who listen to His voice and take His words seriously. To listen to Jesus, we need to be near to Him, to follow Him, as did the crowds in the Gospel who ran after him through the streets of Palestine. … But we also listen to Jesus in his written Word, in the Gospel. Let me ask you a question: do you read a passage from the Gospel every day? Yes, no, yes, no, so-so. But it is important. It is a good idea to have a small Gospel, a pocket-sized Gospel that you can carry around with you, and to read a short passage from it at any time of the day. At any time in the day I take the Gospel out of my pocket and read a little something, a short passage. There we find Jesus, Who speaks to us, in the Gospel! Think about this. It is not difficult, and it is not even necessary to have all four of them: we can carry just one of the Gospels, a little copy, with us at all times. Let us always keep the Gospel with us, because it is the Word of Jesus, so that we can listen to Him at all times. The Pope commented that, in order to share the Word of the Lord, we must learn to “ascend” in prayer and “descend” with fraternal charity, and he emphasized that this is a mission that involves the entire Church, all baptized persons. “In this episode of the Transfiguration, I would like to comment on two significant elements that can be summarized in two words – ascent and descent”, he said. “We need to take time out to climb the mountain in silent space, to find ourselves and to better hear the voice of the Lord. We do this in prayer. But we cannot remain there! The encounter with God in prayer inspires us to go back down the mountain, onto the plain, where we meet many brothers and sisters who are weighed down by fatigue, injustice, ignorance and poverty, both material and spiritual. We must bring to these brothers of ours who are in difficulty the fruits of our experience with God, sharing the grace we have received. And this is curious. When we hear the Word of Jesus, when we listen to the Word of Jesus and commit it to our hearts, that Word grows. And do you know how we make it grow? By giving it to others! The Word of Christ grows in us when we proclaim it, when we give it to others. And this is Christian life”. Finally, the Bishop of Rome asked all those present to turn to the Mother of God and our Mother, invoking her guidance in our Lenten journey.